Chocolate and social media once more top the list. And folks seem to have given up giving up Bieber. 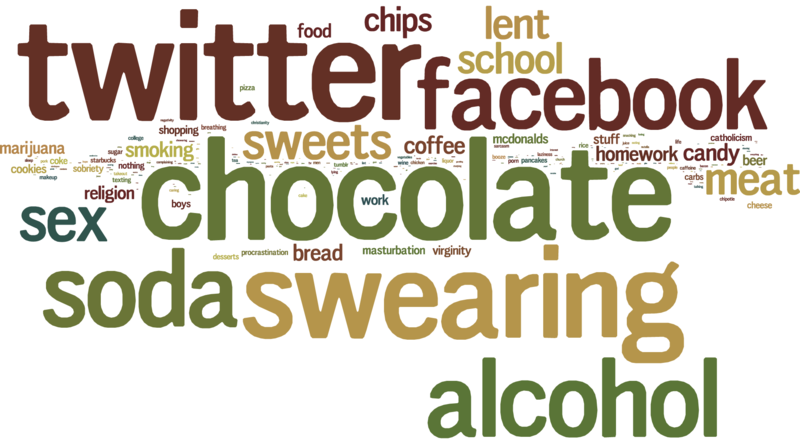 Editor's note: For the past four years, Stephen Smith has used Twitter's API to take a snapshot of what people say they are giving up for Lent. Each year, the list is a mix of the sincere and the sarcastic, the earnest and the anti-religious. But each year, it results in a fascinating look at American spirituality–especially with the recurrent themes of people tweeting how they plan to give up social networking for the 40 day season of fasting. Chocolate comes in at #2–however, if you add up all the mentions of chocolate in its various forms ("chocs," "chocolate chips," etc. ), it totals over 14,000 mentions, enough to put it at #1. Last words from my Aunt Peggy.